Sen. Rand Paul has placed a hold on the U.S.-Israel Security Assistance Authorization Act of 2018, which provides Israel with $38 billion in military aid over the next decade, reports the Jewish News Syndicate. A hold is a procedure where a senator tells his or her floor leader that he or she does not want a specific measure to reach the floor for consideration, and therefore may filibuster any motion to proceed to debate the bill or other measures. However, JNS reports that in this case, Majority Leader and fellow Kentucky Republican Sen. Mitch McConnell does not have to abide by Paul’s request. In the end, Rand won't be able to stop this bill but the attempt to halt it and bring attention to this horrific funding has to be commended. 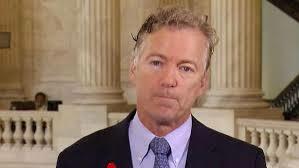 This is a brave move by Rand that makes him stand out from the cowardly legislative pack. And to think that at one time (especially during his obligatory visit to "The Holy Land"), I doubted this guy big time. No More. I saw on another site, someone (virtually) shouting "Rand And Tulsi!! Independent!!! My slogan. Hopefully it's got legs.